TeamLava games are free to download and play. 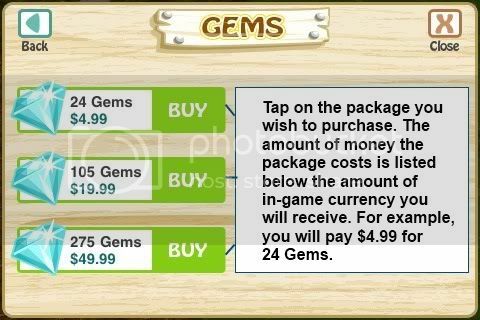 Like many apps from iTunes or the Android Marketplace, we offer certain products through In-App Purchase/Billing, such as Gems, City Cash or Club Cash. These are optional parts of our games and serve to enhance various aspects of user experience and gameplay. Also similar to other apps on iTunes/Android Market, our games use the in-app purchasing process, specific to either iTunes or Google Checkout (dependent on if you are using an iOS or Android device). In this process, for your security and protection, Apple/Google handles all aspects of the transaction. Once Apple/Google verifies and confirms your transaction, it notifies the app developer -- in this case, TeamLava -- to credit your game account with Gems or Cash. You will need to contact Apple directly, since the transactions are handled outside of our system. We apologize for the inconvenience. Please email support@teamlava.com, and provide the name of the game affected, your Storm8 ID, and the full text of your receipt. Please e-mail support@teamlava.com with a copy of your receipt and your Storm8 ID. Our TeamLava representatives would be happy to assist you. We understand that sometimes unintentional purchases happen. In this thread, we wish to help you prevent such purchases by explaining to you more about the purchasing process and your options. 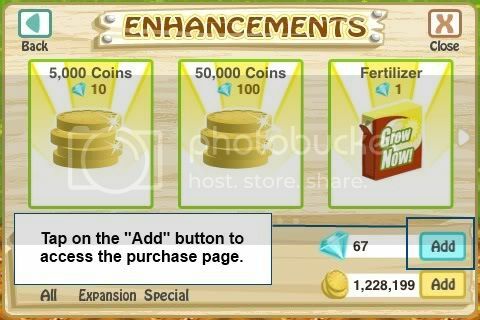 Inside the game, after you select a package to purchase, a confirmation box will appear. You have to choose between "Buy" or "Cancel" before you can proceed further (see FAQ below for more details). After you decide to "Buy" on an iOS device, iTunes may also ask you to enter your apple ID and password depending on when you last used it. For more information regarding iOS In-App Purchases, please see https://support.apple.com/kb/ht4009 (Buying an in-app purchase). On Google Checkout, before you select "Accept & Buy" on the Confirmation page, you will be asked to enter your payment information if you have not used the service before. Below, you will find a method you can implement to restrict in-app purchases on iOS devices as well as a FAQ we have prepared for you. If you would like to restrict In-App Purchases from being made, please visit your device's Settings menu -> General -> Restrictions. Turn off In-App Purchases under "Allowed Content". Please see https://support.apple.com/kb/HT4213 (iPhone, iPad, and iPod touch: Understanding Restrictions) for more details. 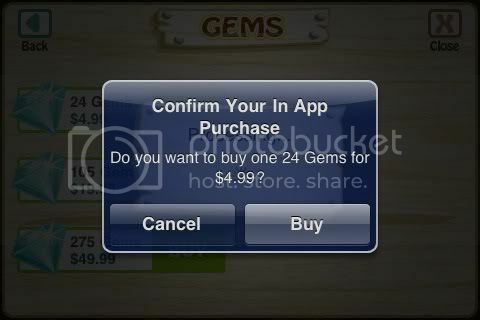 The pictures below refer to the purchasing of Gems. The process for City Cash is the same except for some changes in image and text. 1. When you are in the Store Mode (Build Mode for City Story), tap on the "Add" button (pictured below). 2. You will be taken to the Purchase Page (pictured below). 3. Tap on the package you wish to purchase. 4. You will be prompted with a message (pictured below). 5. After you have selected "Buy," you may or may not be prompted to enter your iTunes account password depending on when you last used it. Please see https://support.apple.com/kb/ht4009 (Buying an in-app purchase) for more details. If you would like to restrict purchasing on your Android device, please visit checkout.google.com, and remove any credit card/payment information stored on that account. There is not a universal way to disable In-App Billing on Android devices, but if you contact your device manufactorer, there may be a method to do this on specific Android devices. Thank you for being our players! We always appreciate your feedback. Last edited by GroupMagma; 09-15-11 at 11:56 AM.